ATLANTA 3/13/18: Nuclear Watch South made a third request on Tuesday to the Georgia State Board of Professional Engineers and Land Surveyors for official investigation into alleged engineering malpractice at Vogtle 3 & 4. The statewide environmental nonprofit is concerned that the engineering licenses of lead contractors at Vogtle 3 & 4, that is, Southern Nuclear Company and Southern Company, have been lapsed since 2000. Nuclear Watch South is further concerned about the practice of using drawings in construction of Vogtle 3 & 4 which have not been reviewed and authorized by registered professional engineers. Nuclear Watch South initially requested an investigation in December and subsequently received a series of brief dismissals from Georgia Power, the State of Georgia and finally a vague and nonspecific issue closure statement from the U.S. Nuclear Regulatory Commission (NRC) whom Georgia Power believes to be the responsible authority for engineering standards at Vogtle. The practice of using blueprints without professional licensed engineer's review and signature was established from the start of Vogtle 3 & 4 construction by Westinghouse, who managed the reactor and site construction prior to Southern Nuclear and who is also the Vogtle AP1000 reactor designer. A 2011 internal Westinghouse memo was uncovered by Charleston Post & Courier investigation which discusses the likelihood of the Westinghouse practice running afoul of state laws and legal challenge. The memo was suppressed until September 2017 when it was uncovered by the Charleston Post and Courier following the July 2017 cancellation of the other AP1000 project under construction in South Carolina. 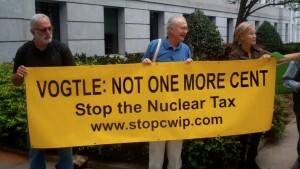 The recent filing by Nuclear Watch South challenges Georgia Secretary of State and Georgia Power arguments that Vogtle is not in Georgia’s jurisdiction. The group renews its request for an investigation and asks that the engineering issues be placed on the agenda at the May 8 board meeting in Macon. In its request, Nuclear Watch South forwards to the Board the NRC's closure memo to National Society of Professional Engineers (NSPE) which had asked for NRC investigation into blueprint practices in South Carolina back in October. In its February memo closing the issue with NSPE, the NRC is clear that it does not require RPE (registered professional engineer) oversight for all of the drawings and blueprints and describes the limits to its oversight and investigation practice at a reactor construction site. While the federal agency does not require all blueprints to have professional review and signature, it does require project closure documents to bear the stamp of an RPE. However, it only inspects such documents in response to specific allegations, which leaves a regulatory gap in the opinion of Nuclear Watch South. In a telling footnote, the NRC discusses the need for a clear regulation as to the nature of agency requirements with respect to RPE review. Nuclear Watch South also forwards to the State Board the NRC's civil fine of $145,000 issued in February for faked inspection reports at Vogtle I and II which were submitted by at least 13 Southern Company employees over an extended period of time. The NRC letter says the faked inspections were the result of “deliberate misconduct” by Southern Company system operators which “intentionally precluded” the safety and regulatory oversight of the NRC at Plant Vogtle. Southern Company admitted the problem and has undertaken additional training to correct the erosion in safety culture at Plant Vogtle. In its February 9, 2018, filing with the Board, Nuclear Watch South cites the National Council of Examiners for Engineering and Surveying, Georgia listing for 21,070 professional licensed engineers in Georgia and exhorts the Board to take action to uphold the integrity of the engineering profession in Georgia. In that filing, Nuclear Watch South also reminds that Vogtle AP1000 reactors are no longer warrantied by Toshiba and Westinghouse as part of the $3.7 billion settlement recently given to Georgia Power. As most schools in Georgia, The Savannah-Chatham Public School System has paid surcharge money as part of their monthly bills to Georgia Power. It’s money the schools could have used to hire an additional four teachers. The Georgia Power lawyer said, "They shall take the surcharge money...It’s the law." They should know the law. They wrote the law. And that’s why the law that forces Georgia Power to take schools' money needs to be amended in 2018 to exempt schools.